The final European event for 2017, European Rapid & Blitz Chess Championships, concluded yesterday in Katowice, Poland. “Spodek” Sport and Entertainment Centre, as the official playing venue, hosted both Championships. The blitz event gathered 1086 players, while rapid championship brought together nearly 1200 competitors coming from 41 European federations. Participants of different ages, professionals, amateurs, around 80 Grandmasters and 70 International masters marked the Championship one of the strongest and most numerous ever. After 22 games played on 15th of December in 11 paired rounds, filled with exhausting fights and tough struggles, the title of European Blitz Chess Champion went to Sergei Zhigalko (BLR, 2586 Blitz rtg) who scored 18 points. McShane Luke (ENG, 2702 Blitz rtg) and Michalic Peter (CZE, 2598 Blitz rtg) tied for the second place each with a score of 17.5 points, but according to the better tiebreaks McShane Luke finished second and Michalic Peter took bronze. At the Closing Ceremony, where the European Chess Union was represented by the President Mr. Zurab Azmaiparashvili and the Treasurer Mr. Martin Huba, among the rewarded players were also best Juniors, Seniors and the best female player – Olga Zimina (ITA, 2299 Blitz rtg) who achieved 15 points and 82nd place. European Rapid Championship took place on 16th and 17th December at the same place. IM Vavulin Maksim (RUS, 2485 Rapid rtg) made a big surprise by coming on the top with 6 victories in a row in the last 6 rounds! In the closing round, Russian player defeated Duda Jan-Krzystof (POL, 2678 Rapid rtg) to take over the throne and to be crowned as the European Rapid Chess Champion for 2017! 5 players tied for the second place, all with the same score of 9.5 points, but according to additional criteria, silver went to Duda Jan Krzystof, while Ponkratov Pavel finished third. 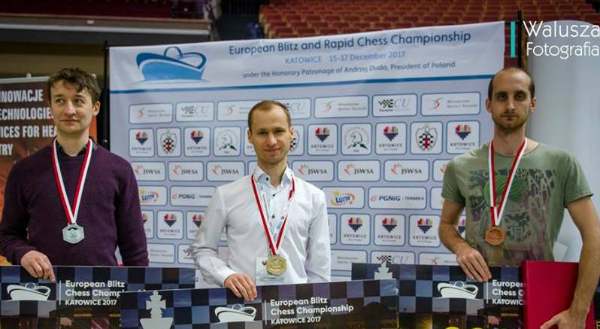 Zimina Olga (ITA, 2376 Rapid rtg) was crowned as the best female player also in the Rapid competition, where she scored 8 points and took 75th place. The President of European Chess Union, Mr. Zurab Azmaiparashvili visited the event, greeted the players and guests at the Opening Ceremony of European Rapid Chess Championship and attended the Closing Ceremony of the event. The president of the Polish Chess Federation, Mr. Adam Dzwonkowski addressed all the present at the Closing Ceremony and the Championship was declared closed. 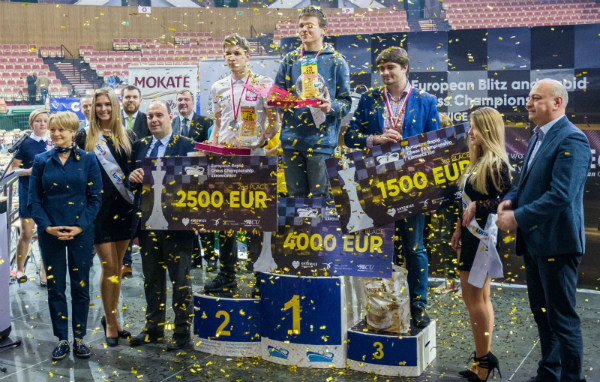 The event was organized by Silesian Chess Federation, the Polish Chess Federation and City of Katowice, a city of chess, where authorities strongly supports chess in many fields and such a great European chess festival as well. The event was organized under the auspices of the European Chess Union.